Jordan Hale is a landscape archivist and the Digital Repositories Librarian at the University of Waterloo Library. They worked at the University of Toronto’s Map & Data Library from 2008 to 2018, spending five years as their full-time Original Cataloguer & Reference Specialist. Jordan recently completed a Master of Information at the University of Toronto Faculty of Information, and holds BA (2010) and MA (2014) degrees in human geography from the university as well. 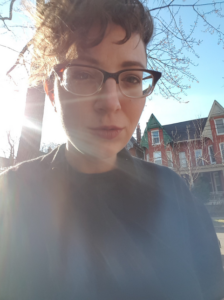 Present research interests include the production of national memorial landscapes in Canada, archiving landscape and broadcast news, and the politics of cartographic cataloguing and classification. In a past life, Jordan worked in photolabs and darkrooms, and as a freelance graphic designer. The name “Microformed” stems from a fascination towards processes of cultural landscape formation and microform reproductions.